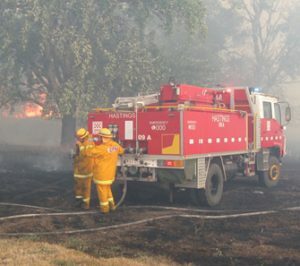 Hastings CFA is a 100% Volunteer Fire Brigade in Victoria, Australia and we’re looking for new members. ● The Hastings Fire Brigade relies on Volunteers to run the Brigade. ● On average, the Hastings Brigade attends 240 calls per year. ● Calls can be many and varied – Structure Fires, Grass & Scrub Fires, Motor Vehicle Accidents, Gas Leaks, Chemical Spills, Public Service calls etc. ● We have Operational (Firefighters) and Non-Operational Brigade Members (Brigade Support, Fundraising, Brigade events etc). Why join the CFA as a Volunteer? Any time we go to a fire call, we say we are on triple time. Although keep in mind as a Volunteer triple of nothing is still nothing! If money is your reason for joining, then go no further. What you will get is a strong sense of community and a sense of achievement by belonging to a cohesive, well-trained group of individuals. We do however operate as a team. You will learn new skills, meet new people from a range of backgrounds and of course, perform a vital role in the community. You do not need any particular skills as nationally recognised and accredited training is provided. What is required is a bit of common sense, some enthusiasm and a bit of time commitment to train and respond to fires. Obviously we can plan the training but emergency calls come at all hours of the day and night, 7 days a week, 365 days of the year. Whilst you are not expected to make every fire call, some minimum response is expected. On average, our members attend 50 calls a year. Brigade training is every Monday night starting at 7:30 pm with the exception of the first Monday of the month which is a Brigade meeting night. New members will go through a 6 month probationary period. During this time, you will complete a “Minimum Skills” training package. Once formally accepted by the Brigade your training will continue in other fields and existing skills will be maintained. There are many different skills you can learn and courses you can do through CFA. Training is conducted locally in and around Hastings for the most part. Specialist training can be conducted at training grounds around the state. CFA is a registered training organisation, so any skills or qualifications gained are transferable to other organisations and workplaces. CFA’s primary concern is for the safety and health of its volunteers. Brigades are responsible for ensuring that volunteers perform their role in a safe manner. CFA needs to know if a prospective volunteer has a condition which may place limitations on their role in the brigade. When CFA is aware of any limitations or restrictions that a person has, the brigade can then avoid placing the volunteer in an environment that is unsuited to their health. As such, you may have to undertake a medical assessment. Obviously some level of fitness and good general health is required to be a firefighter. Do I need to buy anything ? No. All Personal Protective clothing and a Pager is provided. All new members must undergo a Criminal Record check by the Police.